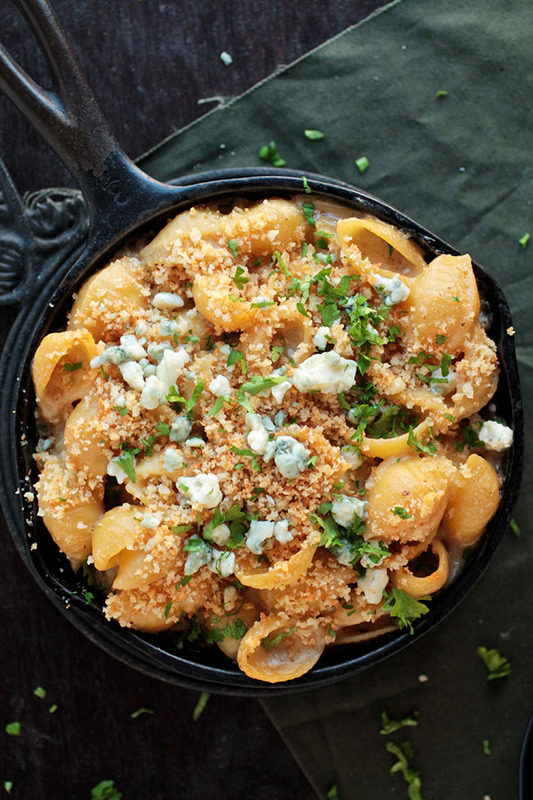 This easy Guinness mac and cheese with white cheddar and blue cheese is sure to be a hit! I am a firm believer that there are few (if any) things more awesome than mac and cheese. Except maybe mac and cheese with beer in it. Which, ummmmmm, gotcha covered. 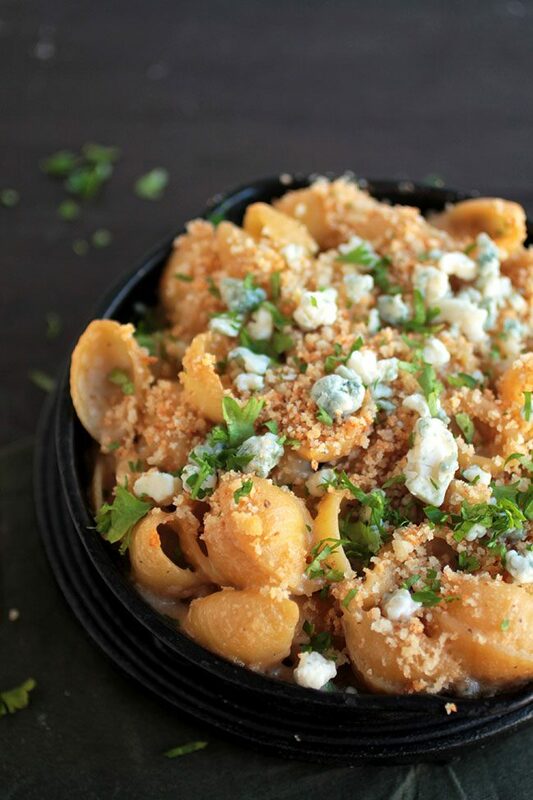 This mac and cheese was inspired by the classic Black & Blue drink – Blue Moon with a layer of Guinness floated on top. I love adding dark stouts like Guinness to cheese sauces, but I wanted to give this recipe a more interesting twist. So I decided to swap the Blue Moon in a Black & Blue for blue cheese, mix it all up with some pasta, and bake it in a cast iron skillet until delicious. And after a few COMPLETELY failed attempts (which involved me paying zero attention and accidentally dumping wayyyyyyy too much blue cheese into the sauce) I do believe we have a winner. The Guinness and blue cheese in the cheese sauce add depth of flavor and a distinctive taste without overpowering the other flavors in the dish. Cook pasta in very salty water until two minutes less than al dente. Drain pasta and set aside. Melt butter in large saucepan over medium heat (I use the same pot I just cooked the pasta in). Add flour and whisk to form a roux. Cook roux for about 1 minute until fragrant. Slowly stream beer into roux, whisking constantly to work out any lumps of roux. Whisk milk into sauce. Let cook until sauce has thickened and just barely reached a simmer, 7-10 minutes. When sauce has thickened, remove from heat and stir in white cheddar cheese until cheese is completely melted. 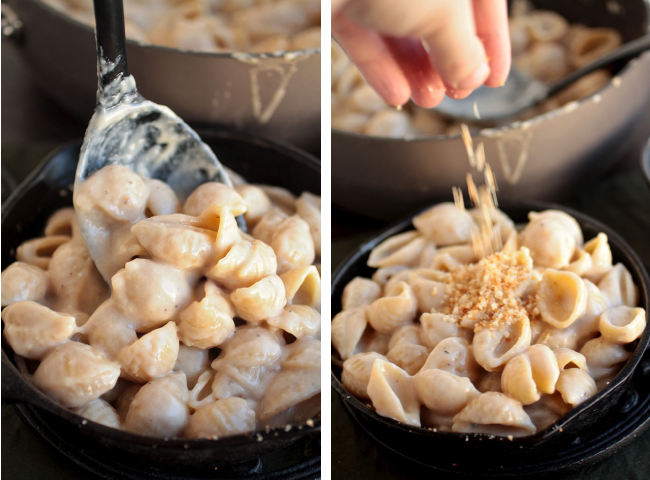 Fold half of the blue cheese into the sauce and reserve the rest for topping the finished pasta. Add cooked pasta to sauce and stir to coat. 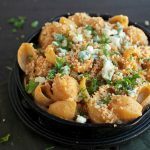 Spoon mac and cheese into a large baking dish and top with toasted breadcrumbs (instructions below). Melt butter in a medium-sized skillet over medium-high heat. Add breadcrumbs and stir to combine. Toast breadcrumbs, stirring occasionally, until they’re lightly browned, about 5 minutes. Remove toasted breadcrumbs from heat and sprinkle evenly across the top of the macaroni and cheese. 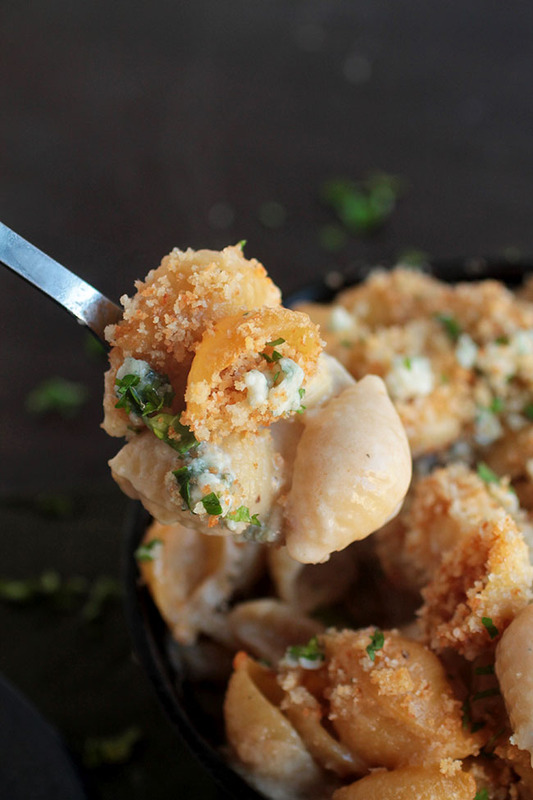 Bake mac and cheese at 375 for 20-25 minutes until breadcrumbs have browned and edges of pasta have crisped up. Remove from oven and top with remaining blue cheese and chopped parsley. Serve immediately. 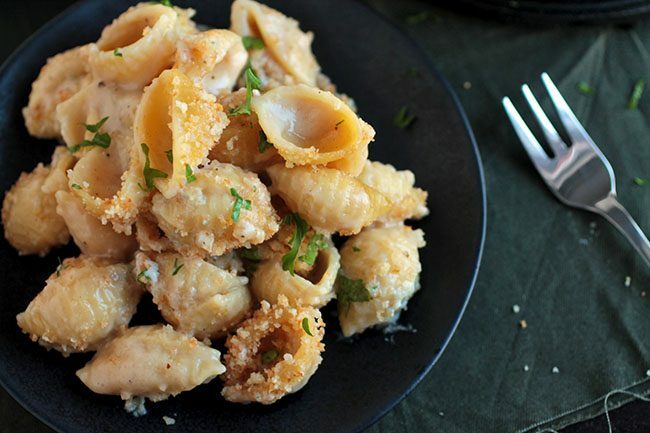 Skip the breadcrumbs if you’d like stovetop mac and cheese – just cook the pasta all the way until al dente and serve as soon as you’ve tossed everything with the sauce! Use more or less beer or blue cheese depending on your personal preference. Not a Guinness fan? Use a pilsner or pale ale instead for a lighter beer flavor!